Originally published in 1880 by A. A. Graham & Co., Publishers, Mansfield, Ohio. This is an 1972 reprint by Unigraphic, Inc. Covers show light wear. Inside pages are very nice and clean. 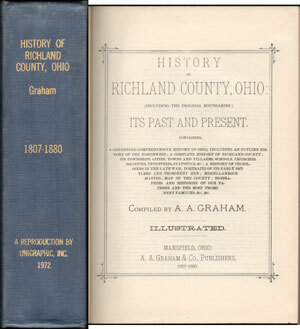 A detailed history of Richland County, Ohio from 1807 and continuing to 1880. Also includes a large number of family biographies. Hard cover, thick volume of 941 pages with an additional 65 pages of indexed names. The book described above is priced at $59.95 plus $1.95 shipping. If you wish to pay by credit card, please use the shopping cart below (checkout goes to a secure server.) Credit card orders may also be placed by phone to Hearthstone Legacy Publications from 9 AM to 11 PM (Central Time Zone) Monday thru Saturday at 816-204-7593.